This site is intended for family and friends of Hilly, Nick, Jenny and Tom Brown. If you have any contributions (pictures, etc), or comments, please e-mail them to us. The village of Birmensdorf with its 5000 inhabitants nestles on the sunny side of the Uetliberg - the opposite side to and about 7 km from Zurich. 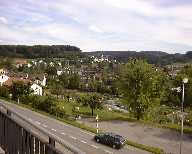 The Birmensdorf page gives a pictorial impression of the village. Some of the things we have been up to (those where we remembered to take a camera along).